Expo SE has proven again to be an excellent occasion to meet many of our licence holders and friends in one place. Although there was perceived to be a reduction in the number of visitors who attended the show compared with previous years, we hope that it has been a successful event for all the exhibitors. German fruit producers had a very difficult season due to an extremely dry and hot summer in 2018, resulting in a compressed season, smaller fruit and lower prices. Investment decisions therefore need to be carefully considered and there was perceived to be a reduction not only in visitor numbers but in the orders being placed for new machinery and equipment by visitors. Fruit plant propagators in the Netherlands were not too badly affected by the hot summer, although the water shortages in Germany meant water tankers were sometimes needed to maintain supplies for irrigation. 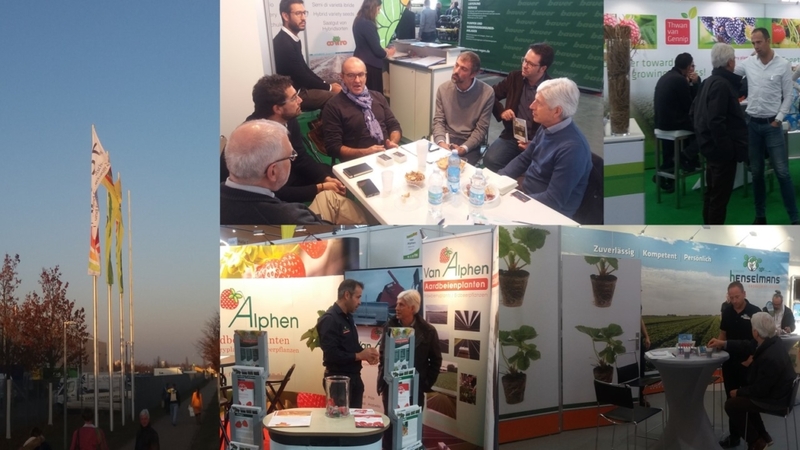 However, overall propagators reported excellent plant quality this year, which will help fruit growers to bounce back in 2019. We were pleased to observe the still growing popularity of Malling™ Centenary, with some excellent samples of Dutch glasshouse fruit on display. There was also early interest in the new late Junebearer Malling™ Allure and the new everbearer Malling™ Champion, which will both be launched in 2019. Marionnet SAS had some attractive samples of Magnum on display, which had excellent flavour and fruit firmness and continues to maintain a place in the premium tier of multiple retailers in the UK and on the continent. We wish all our friends and licence holders a speedy recovery from the challenges of last summer, and look forward to seeing everyone early in the new year at the ISFC in Den Bosch and TSW in Warsaw.